The Samoa National Youth Council (S.N.Y.C. )’s Tracer Youth Employment Survey Report has revealed some very interesting statistics about young people and unemployment in Samoa. • Main reasons for incomplete education are because families could no longer afford school fees, and others have taken on the role of caretakers for elderly and other family members. • 58.61% youths are unemployed whilst 41.39% are involved in income generating activities. • Majority of youth involved in income generating activities are subsistence farmers, relying on agriculture and fishing to sell at the market or around their village to provide for their families. • 68.47% of unemployed youth stated that they are unemployed due to family obligations whilst the rest were either not interested or were aware of any available opportunities. • 92.91% of youth want jobs yet only 48.08% went job hunting (most of which are female). This is due to incomplete education, lack of work experience, lack of required skills, travelling costs etc. 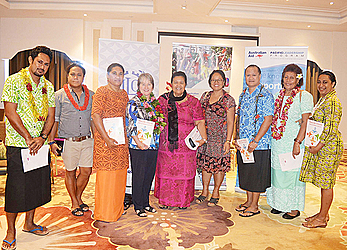 Launched yesterday, the report was launched in partnership with the Pacific Leadership Programme and support from the International Labour Organization (I.L.O.). 1. Explore the common notion that there is no unemployment in Samoa. 2. Identify baseline data on unemployed and/or economically active youths in Samoa. 3. Ascertain issues faced by youth living in the community affecting their participation in the employment sector. 4. Develop a policy statement as a lobbying toolkit in addressing unemployment issues in the youth sector. The survey collected information on youth demographics, levels of education and reasons for non-completion of studies, current employment status, experience in applying for jobs, skills and literacy levels, potential income generating activities available to them from natural resources in their village, and knowledge and understanding of volunteerism. This report underlines that youth need to be more included in policy development at the local and national level as key areas where youth encounter prejudice and discrimination within Samoa include access to healthcare, information and decision making and leadership processes.